What can Kids Learn in a month? Going to school for the first time is a big deal The kids were really brave and managed to separate from their parents without any tears (in fact they didn’t seem bothered at all), but when it came to facing the teachers, they were initially too scared to say “boo”. They quickly overcame their shyness and now march confidently into the school yard yelling “unjani thishela?” (how are you teacher?). They’re even confident enough to get up to a bit of mischief these days! 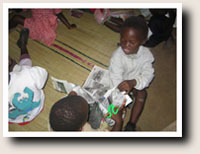 The school day begins in the typical Swazi fashion with songs and prayers. 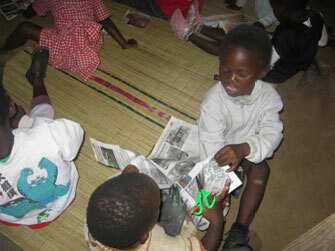 In just a month the kids have learnt a host of songs in Swati and English. These include the Swazi National Anthem (okay some of them don’t quite know all the words) and the Lord’s Prayer (which they’ll need to know for morning assembly at primary school). Getting the kids to sing and pray is not difficult. 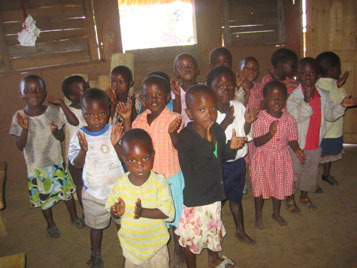 Getting them to stand still and in straight lines or close their eyes to pray is another matter. Do you remember being so little you thought you could open your eyes just a little bit and nobody would notice? Well some of these kids think they can open their eyes, turn 180 degrees and poke the kid behind them in the ear and no one will notice. They must think the teachers also shut their eyes! Who could have imagined operating a pair of scissors could be such a difficult task? It takes an immense amount of concentration when you’re little! The kids try, but whether or not they actually help each other is debatable. At the moment the kids are developing their fine motor skills using scissors and paint brushes and learning to hold pencils properly (a few still prefer to clench the pencil in their fist and scribble like crazy for colouring in). 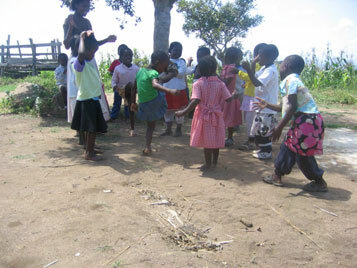 The kids also spend plenty of time running around, throwing, rolling and catching balls and climbing on rocks (and when the teachers aren’t looking the desks) to develop their gross motor skills. 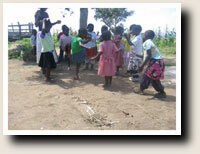 And no Swazi preschool is truly complete without a bit of traditional dancing in the yard. When you’re old it’s kind of difficult to imagine that once upon a time you had no idea how to count, how many things were in a group of objects or what the number three looked like. But it’s all part of being four or five. At the moment the children are learning the numbers 1-3. They can all count “one, two, three” confidently, but when it comes to recognizing the numbers…well, some of them seem to be guessing at this stage! 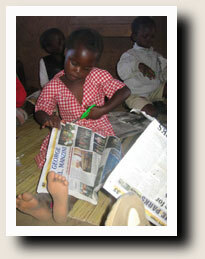 In Swaziland the kids speak Swati. They usually begin learning English at Primary School, but this group are expanding their English vocabulary amazingly quickly! By the time you come to visit they’ll all be able to say “My name is…”, tell you whether they’re a boy or a girl (there’s still a bit of confusion at this stage) and their age in English. Hopefully they’ll be able to do it without simultaneously picking their nose or pulling their jumper over their head–but no promises! 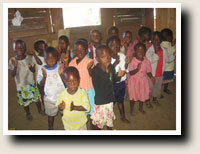 But hey, it’s only preschool and the most important thing is that the kids have fun and learn to play together nicely. As beautiful as they are, they’re not perfect- occasionally they fight and beat each other up. But they do a remarkable job of sharing two balls between 19 kids and entertaining themselves with very little. Hopefully soon they’ll have swings and hoops and other play equipment to share.